Potato salad with a silky, creamy guac instead of mayo? Seriously. This is a favorite from Vegan Brunch, and I wanted to put it up for you just in case you’re looking for something a little different for your BBQ this Memorial Day. It’s ridiculously simple to make and beyond delicious. The secret to the creaminess is a food processor. Prepare this as close to serving time as possible. It can sit for a couple of hours, but anything more than that and the avocado will brown. Put potatoes in a pot and cover with water. Cover pot, bring water to a boil. Lower the heat to a rolling boil and cook for 15 to 20 minutes, until potatoes are easily pierced with a fork. Drain and set aside to cool. Once potatoes have cooled, prepare the dressing. Split the avocado in half, remove the seed and scoop the yumminess into the food processor. Add the lime juice and salt and puree until smooth, scraping down the sides with a spatula as needed. Once smooth and creamy, add the tomato and onion. Pulse until they are incorporated but not completely blended. You should still be able to see the tomato and onion. Put the potatoes and cucumbers in a large mixing bowl and mix them up. Add the dressing and mix well. Taste for salt and spice. Wrap tightly and chill until ready to use. Top with scallions, if you like. Sounds delish! I’m going for it! Would this brown at all or will the Lime juice keep it completely in check? This sounds gorgeous. I used to do something similar with hummus/houmous when I wanted potato salad without mayo… Think I’ll be trying this instead… 🙂 Thank you Isa. But it calls for lemon instead of limes and no spice. I’ve kind of gotten burnt out on theirs and can’t wait to try yours! That is the most perfect little tomato. This looks heavenly! Can’t wait to try it!! Oh my heaven in a bowl on earth!!! Best of two worlds – guacamole and potato salad!!! Awesome. Tried it, turned out star spangled. Thanks for sharing. Genius idea – seriously! It was absolutely delicious. Why didn’t I think of this??? 🙂 That’s why we love you, ISA! This is my summer “go-to” for potlucks and family outings, now. just so happened to have everything needed for this (except onion but substituting a jalapeno gave it more of a kick) and took it to a memorial day picnic. i will never ever make potato salad without avocado as the base ever again. everyone was in awe and it was gone before it could even get a chance to brown. It looks so yummy! I can’t wait to try! Is there a printer friendly button for the posts on this site??!! Help! This is fantastic! My 3 kids gobbled it up! Yum! It’s like potato salad and guacamole had a one night stand and… well… you know. I made this for a cookout and everyone who had some really enjoyed it! I only used 1/2 of the red onion called for and it was onion-y enough for me. I first make this last year (from the Vegan Brunch cookbook) it’s so good, I get requests to bring it to gatherings. 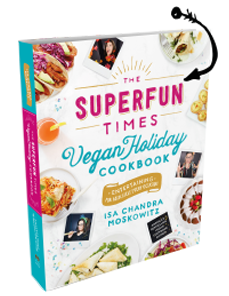 I strongly recommend buying the book I have found so many great recipes that my husband (the Vegan) and the kids and I (non Vegan) love. I’ve made pesto potato salad lots of times but never thought of using guacamole. Yum. Can’t wait to try it! Thanks for this recipe! I recommend cilantro or parsley thrown in as well. Made this for dinner tonight and holy guacamole (+ potatoes)! This stuff is delish! I don’t like the taste of mayo – vegan or not, so this is awesome and has it’s own flavor that I love! I added raw garlic. So yummy! This has been one of my favorite summer dishes! I diced radishes instead of the cucumber and loved the added spiciness. Yum!! 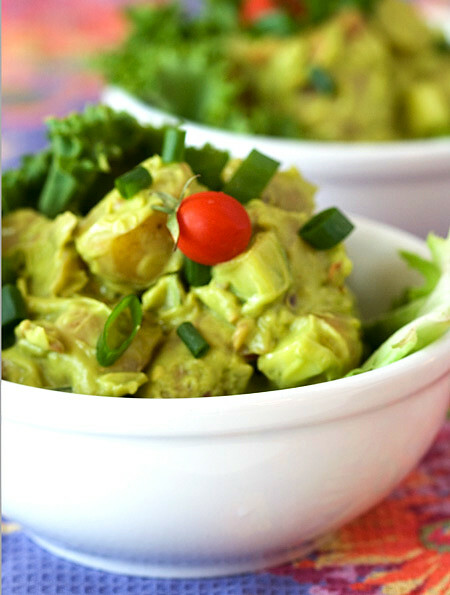 meatless monday: creamy avocado potato salad | here / there / everywhere. Holy Yumminess!! This is one of my favorite summer recipes! Thanks! I just decided to go vegan today, so this was my very first recipe, and even my mom, the professional chef, loved it! I suggest a little less lime next time, it sort of over powered the avocado. I was only making this for two, so I had two smaller potatoes and sort of haphazardly reduced all the other quantities. Nothing mathematical, just ‘few scoops of avocado looks about right’ sort of stuff. I had kipfler potatoes and I left out the cucumber (yuk). Anyway, it was amazing. What I love about you guys is that you think of such creative ways to use plant foods – why use vegan mayo when you’ve got avocado? Next time I’ll make this to the recipe and I’m certain it’ll be even more delicious. I’m suspecting this is going to become my standard bring-a-plate fare. Yum! yum!!! I am totally making this tonight! Thanks! This was absolutely amazing! I couldn’t find any fingerlings, but the Yukon Golds i found were fabulous 🙂 I dislike cucumber, so nixed that. And added garlic and lots of cilantro (I HEART cilantro!). It was like eating a bowl of guacamole, and it was WONDERFUL. Finally! A vegan potato salad that DOESN’T use vege mayo! I hate all that prosecced fake vego stuff and this dish sounds amazing – am making it tonight with vegetable and tempeh skewers with tamari, garlic, ginger, viniger and semsame oil marinate…mmm should go together nicely! i was so glad to see that this didn’t have any vegan mayo! love alternatives 🙂 i would have added pickles, if i would have thought of it! it was so yummy. this was so great! made it last night! put alot of lime juice in it and used Greek yogurt to make the avocado go farther. it is still a pretty light green color! so good!! thanks!! How many does this serve? We are doing a wedding in July tor 100 and wonder what to multiply the recipe by. Deeeeelicious!!! What a fan’freakin’tastic idea using avocado for as the dressing instead of vegan mayo. I’ll be making this again and again and encouraging my nonvegan / nonvegetarian friends to try it. Thank you!! This is tasty and adaptable in my experience – I added green bell peppers, zucchini, and broccolini and they worked very well. This is pretty low calorie too for a potato salad. Sherie – I know a pound of potatoes typically yields 3 cups of chunks, maybe that helps your calculations! I had a potluck today and somebody brought this. Delicious, absolutely on my list of “soonest”! This looks delish! I can’t wait to make this for memorial day with friends! Oh this was so good – Thanks for sharing! What To Serve At A Vegan BBQ « That Was Vegan? Oh, and if you add a teaspoon or so of lemon juice it keeps it from browning longer. Mine was in the fridge overnight and it hasn’t browned yet! So delicious–I just made it. Added extra cayenne, salt, and pepper. We made this last night to go with BBQ seitan ribs and corn on the cob (to celebrate 80 degree weather in SC in January), and it turned out great! It really does have a great southern taste! We halved the recipe and it came out wonderfully! This recipe has completely changed our paradigm about potato salad! YUM! I found this recipe by searching “avocado” on this site… It sounds delish! Except I only have sweet potatoes on hand. And only a white onion. And lemon, not lime. And no cayenne, just black pepper. And no cucumber. And I don’t feel like using my blender. BUT I DO HAVE TWO AVOCADOS! LMAO. I am TOO excited to try eating my avocado and potato together to wait til I get a chance to get to the grocery store. MUST. MAKE. POTATO.SALAD.NOW !!! It will be interesting.. Thanks for the inspiration! The first PPK dish I attempted was Mac n Shews – YUMMM. Now that recipe I DID follow to a t.. My blender caught fire – obviously wasn’t *quite* up to the task. But it was so worth it in the end! Should the potatoes be peeled or not? very yummy, thanks! I only used half an onion though because a whole onion was a little much. wonder what it would be like with a hard boiled egg or two crumbled up??? tried it, won’t make it again…. Viva Vegan | Celebrating vegans & all people who love the vegan lifestyle! this was a hit at a recent beach BBQ! I read that if you put an avocado pit in when you cover it, it will stay fresher longer; I’ll try that next time. Looking up recipes for my Yom Kippur break fast. I have a bag full of Russet potatoes that I want to use. Do you think I can sub the Yukons out for this potato salad? Tried the potato salad yesterday good recipe you have shared with Avocado see http://recipespassion.blogspot.com/ thanks for sharing! Wow realise I’m 3 years behind this post but this is amazing! Then you had those that would come out and tell someone that they were wrong. Berry belt case is just a click away. Then take your arms and place them behind you on the surface. be a difficult and challenging endeavor. Made this for a potluck. Had no regrets. Made this for a pot luck at work and it was enormously popular. Since I was making it in advance, I kept the dressing in its own container, with a sheet of plastic wrap pressed down over the top, and then mixed everything together right at serving time. Delish! I wasn’t sure about the heat tolerance levels of folks so I left out the optional cayenne, but that definitely would have made it even tastier, so I will keep it in next time. Highly recommended! I’ve had to print 4 copies of the recipe in the last hour. Made this for Mother’s Day brunch this past weekend to rave reviews! Absolutely delish! Memorial Day Grill Out | Life. Updated. Instead of cayenne pepper, if you like a kick, add a little bit of jalapeno to the dish. YUM. That is the most perfect little tomato. This looks heavenly, i Can’t wait to try it.